Praised by Salon as "hilarious" and "artful", O Magazine as "A lovely little corner of the Internet," and called, "Instant profoundness" by Buzzfeed, Slaughterhouse 90210 pairs literature's greatest lines with pop culture's best moments. 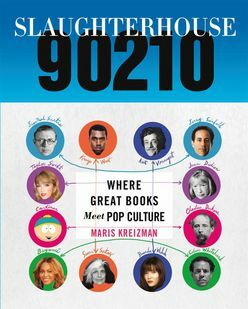 In 2009, Maris Kreizman wanted to combine her fierce love for pop culture with a lifelong passion for reading, and so the blog Slaughterhouse 90210 was born. By matching poignant passages from literature with popular moments from television, film, and real life, Maris' work instantly caught the attention (and adoration) of thousands. And it's easy to see why. Slaughterhouse 90210 is subversively brilliant, finding the depth in the shallows of reality television, and the levity in Lahiri. We see Taylor Swift paired with, "Above all, she is the girl who 'feels things'. The girl ever wounded, ever young," by Joan Didion. Tony Soprano, waist-deep in a pool surrounded by ducks is accompanied by a line from Middlemarch about, "The patches of hardness and tenderness [that] lie side by side in men's dispositions." These two pieces of art complement and deepen one another in surprising, profound, and tender ways. Slaughterhouse 90210 is a book for anyone with a Netflix account and a library card. With over 150 color photographs from some of popular culture's most iconic moments, Kreizman shows why comparing Walter White to Faust makes sense in our celebrity obsessed, tv crazed society. Kurt Vonnegut, meet Brenda Walsh. A wickedly clever and surprisingly profound pop culture mash-up, based on the blog with more than 150,000 loyal fans.